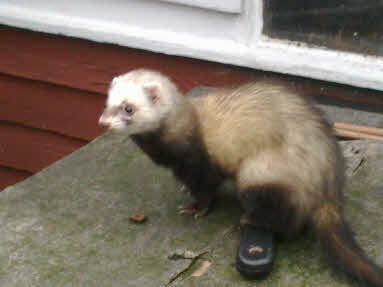 This was Maisy, arrived spring 2014, a rescue ferret that required the services of Snowy, a vasectomised hob ferret and subsequently gained a home with me. She was kept on her own until a vacancy arose in the cage housing Jenny and Beryl on the death of their cage mate Dimrat. She was small friendly, playful and highly active. During June 2015 she became lethargic, never a good sign in ferret health, it was discovered she had internal bleeding. Despite treatment at a vet’s, she subsequently died.